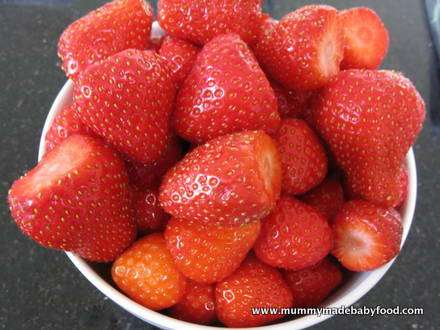 ﻿Strawberries equal summer, and this baby snack recipe keeps summer going by packing all the goodness of fresh strawberries into frozen treats for your little ones.﻿ Not only are fresh, ripe strawberries gorgeous to look at, but they are also fragrant, juicy, delicious and extremely good for you. Strawberries are an excellent source of vitamins C and K and contain significant amounts of flavanoids, which contribute to their bright red colour. They contain powerful antioxidants, which help protect against ailments, including inflammation, cancer and heart disease. Strawberry season tends to be quite short, at least here in the UK, running from end May through July. I'd never given much thought to how these berries acquired their name, but apparently, in order to maximise yield and protect them from muddy soil during this short season, farmers spread a layer of straw around each new plant. Hence their name. Ice lollies (aka ice pops or popsicles) are a wonderful treat at any time of year, but particularly so during the hot summer months. Little mouths love slurping away at their refreshment, and they can be particularly helpful for a teething baby with sore gums. I like to keep a stash in the freezer for impromptu snacking or pudding after the evening meal. 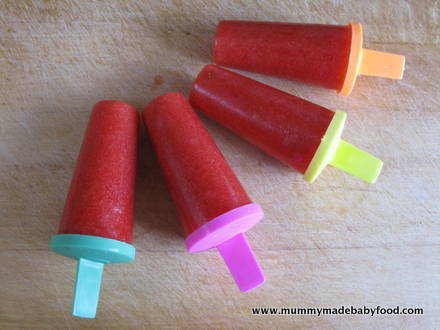 These ice lollies are a completely guilt-free baby snack, as they contain no refined sugar. The recipe does call for honey, which you can omit for babies under 1. The key to this recipe's success is using the freshet, ripest and most fragrant strawberries you can find. The natural sweetness of the strawberries really comes through, and you may find that you don't even need to add honey. I personally wouldn't attempt this recipe using less-than-perfectly-ripe strawberries, as the end result would be too disappointing! 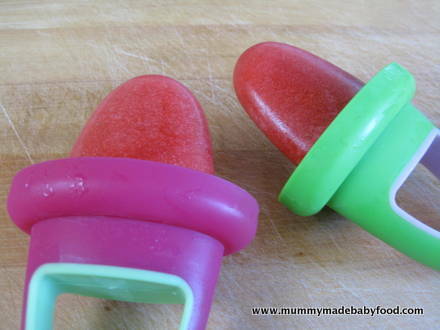 This recipe yields approximately 800ml of strawberry mix to fill lolly moulds or ice cube trays of varying sizes. Any leftover can simply be enjoyed as a strawberry smoothie! Rinse the strawberries, and remove the green tops. Put all the ingredients in the blender, and blend until uniform and smooth. Pour the mixture in ice lolly moulds of your choosing, or into ice cube trays.